As I prepare to celebrate the amazing holiday that Thanksgiving is I can't help but reflect on all the incredible blessings I have been given. Just as the attendees of the first Thanksgiving we set aside this day to reflect and give thanks for all we have. As I mention quite a bit I am immensely blessed. With both family, friends and of course each of you my life is full and rich and truly lacks for nothing. I have to remember that many days when I spot the new #fillintheblank that captures each of our eyes. 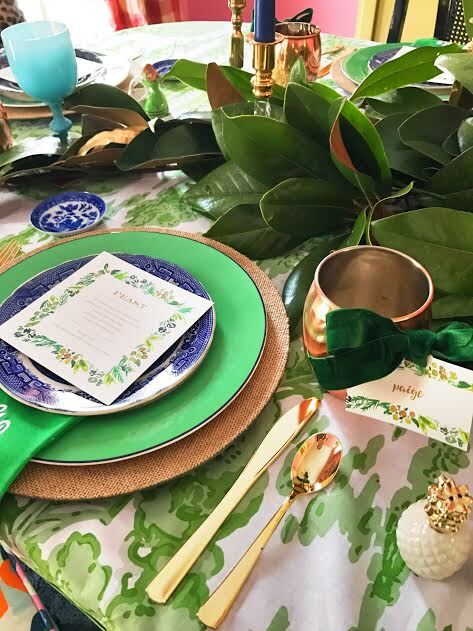 This year when designing our table I worked with two incredible companies to bring together what may be my favorite fall table to date. 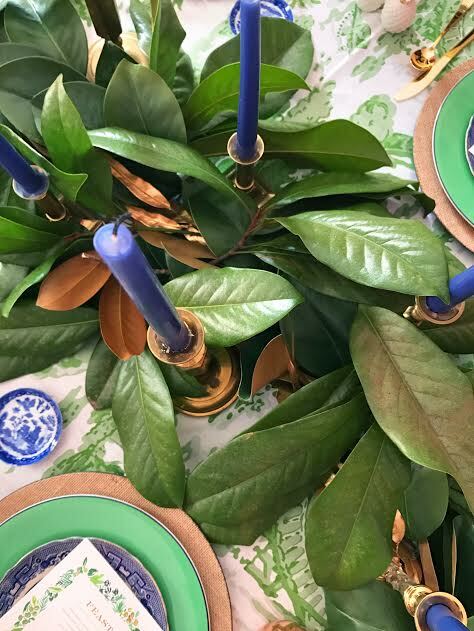 Mixing together my favorite blue and white dishes and a new addition of green I am thrilled with the set up that I have enjoyed for a few days as I pass the room heading to other parts of the house. Since the leaves are turning and falling to the ground the green was a fun choice to make sure I still have a good splash of green in my immediate vision. 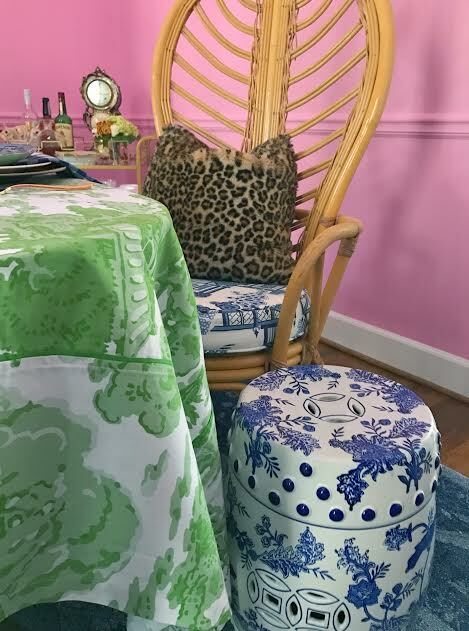 I am a girl who likes to use what she has mixed in with a few new things to make the old things feel bright and shiny when sitting next to their new friends. 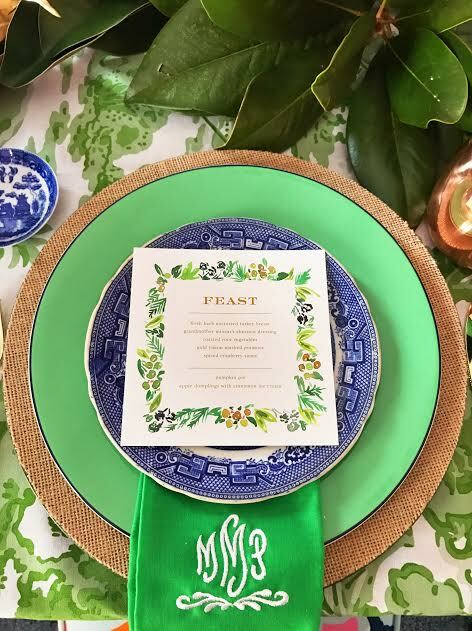 I rarely use our Blue Willow salad plates so this set up was truly a treat for me. 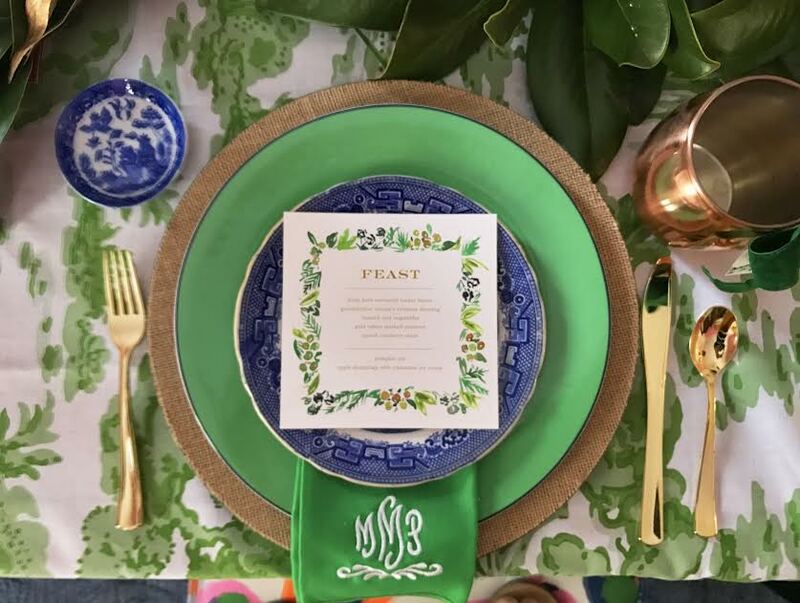 I used burlap chargers that I already owned along with a Chinoiserie green tablecloth from a few years ago and mixed in Kate Spade green dinner plates (thank you Lance!) and the blue and white salad plates and butter pats I was dying to use. 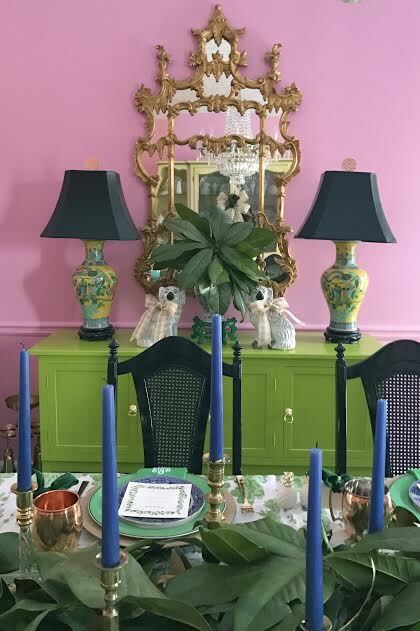 I headed to my favorite spot for fabulous finds and gathered up some amazing pieces to add to not only the table but also the room. My choices from At Home round out the table perfectly and also create two spaces to have more serving area and easy access to things I will need for the day. I love that family and friends will be able to make drinks and serve themselves while the Hubs and I are still pulling together last minute things to finish off the meal. 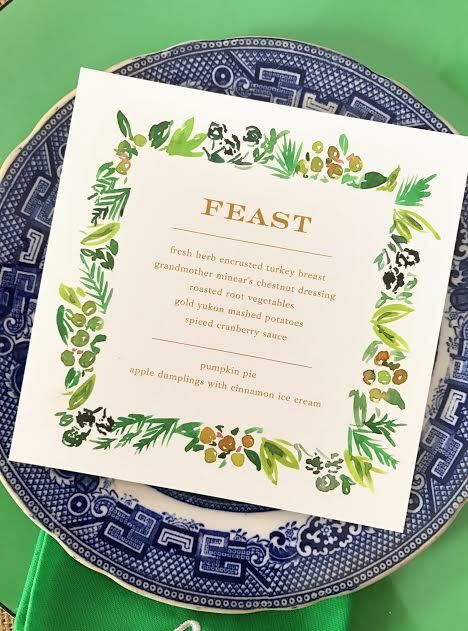 I am smitten with the incredible menu and place cards I chose designed by Gina Langford from Dixie Design Collective. Aren't they amazing?? 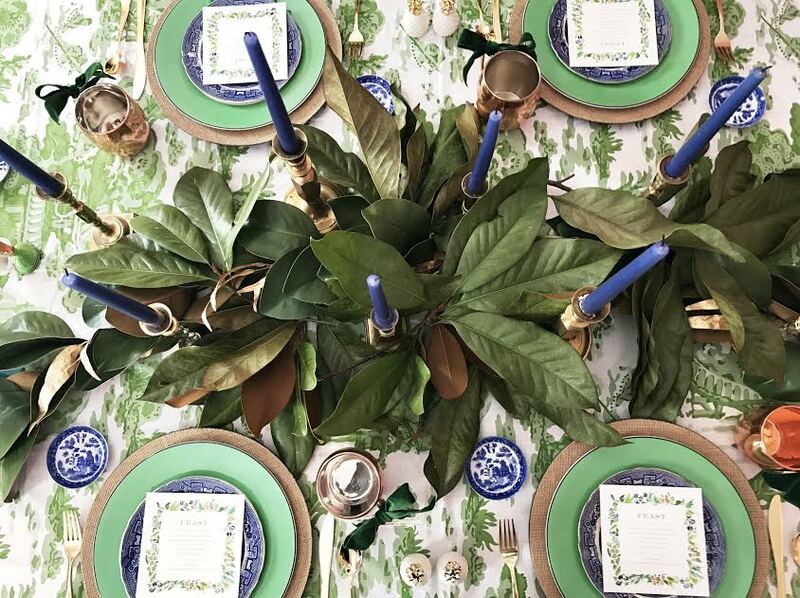 I love how they tie all of the blue and magnolia together to create a fabulous fall dinner. The girls were incredible to work with and helped me chose exactly what I was looking for and then narrow down font options. I was looking for a feeling of warmth and comfort instead of a feeling of formality. The lower case fonts we mixed together created exactly what I was hoping to achieve. I love the customer service the girls provided, never once did I feel like they were anything other than helpful when I kept changing my mind. Being so picky can sometimes not be my friend. 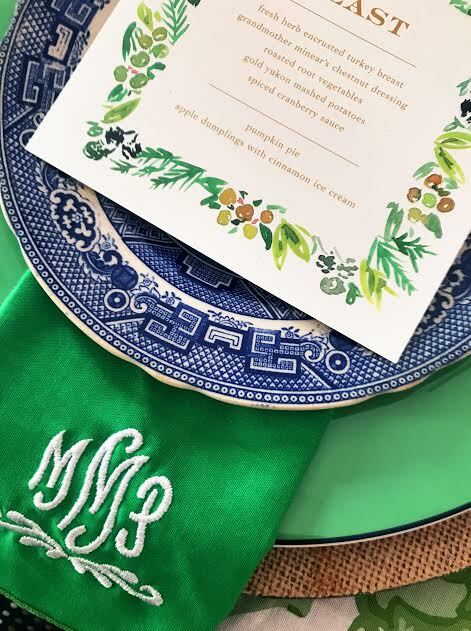 My menus and place cards arrived so quickly and the wrapping and personal note that always impresses me took my breath away once again. I have my eye on two other designs for Christmas gatherings. #yay!!! 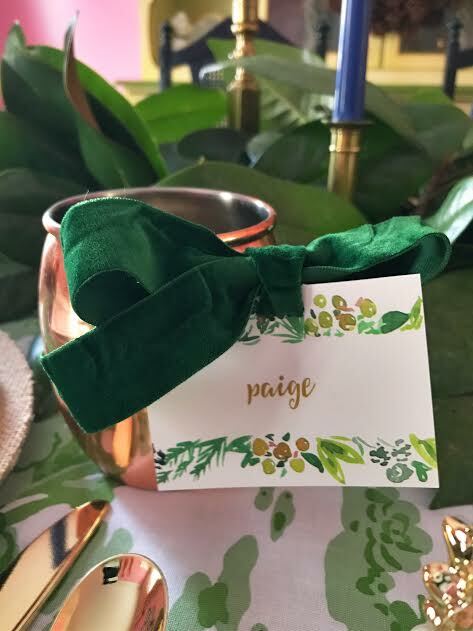 I decided to tie the place cards to my At Home copper mugs for two reasons. I love that it changes it up and I love that when the cups are picked up from the table and used there is no question who's drink belongs to whom. Win, win! One of my favorite things I found during my shopping trip to At Home was this darling pair of blue and white garden stools. 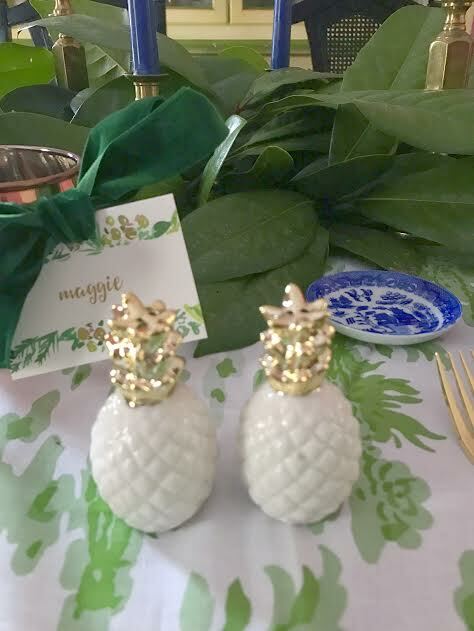 I love them and they are perfect for so many places but I love them next to the head chairs to hold anything that becomes overflow from the table. A water pitcher or a basket of rolls would be ideal sitting on these stools during our Sunday meals and definitely during the feast on Thursday. Aren't they darling? The most exciting piece I purchased while shopping the aisles of At Home is this amazing three tiered bar cart. I love it!!! 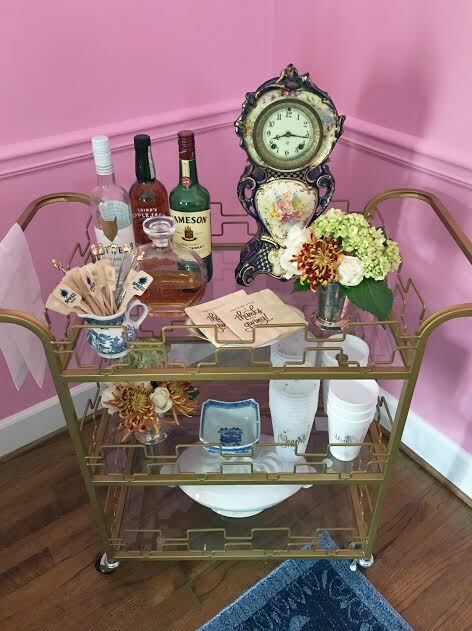 And yes I do have more than one bar cart, and I am perfectly ok with that fact!! It is already in use I as I am stocking it for next week. I have two drinks planned and the ingredients for the punch are already laid out on the top shelf minus the juices. I have planned a yummy kid friendly fall punch that adults may add the mix in of their choice. 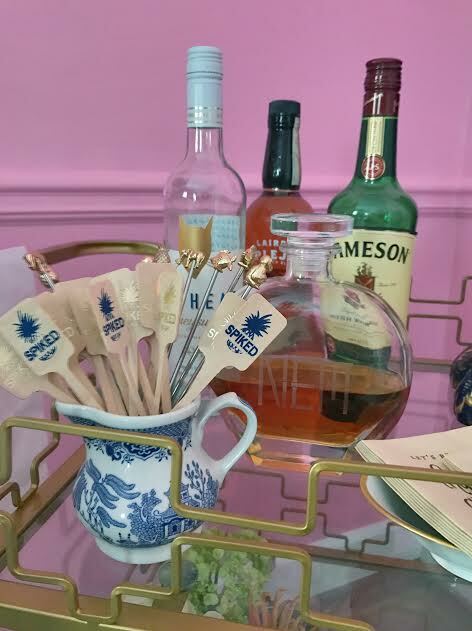 The spiked stirrers work perfectly with this plan so the kids know which drink clearly doesn't belong to them. Love every single thing you do with style and elegance.....so very beautiful. Hope to meet you in person one day...love all things creative and you have such a gift! 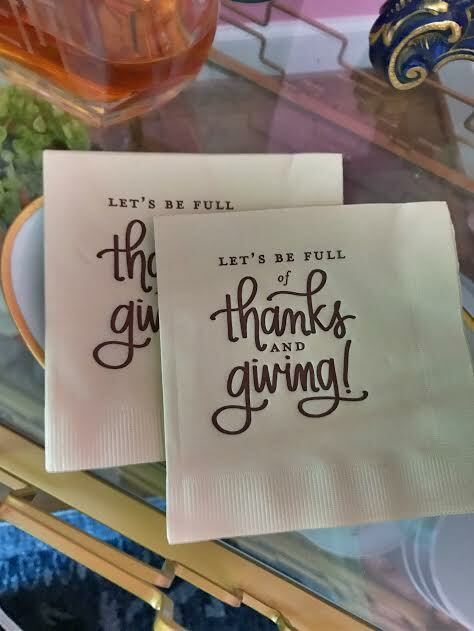 Such a beautiful thanks giving table design. 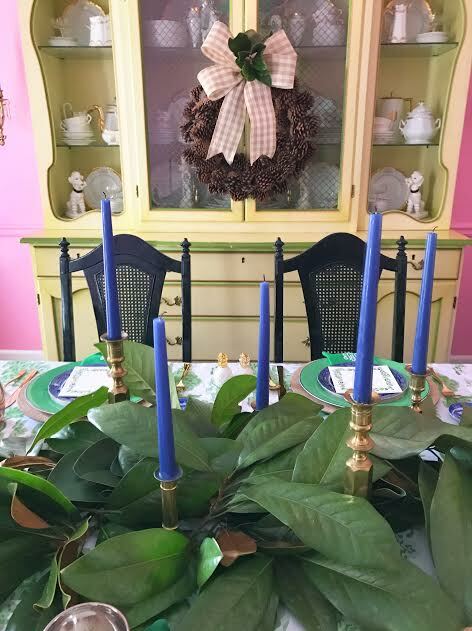 Everyone will be delighted to see this unique table arrangement, something to keep the atmosphere more merry than ever. Can't way to show this to my students at essay service here and write my own review about the setup.